But first you have to get there. 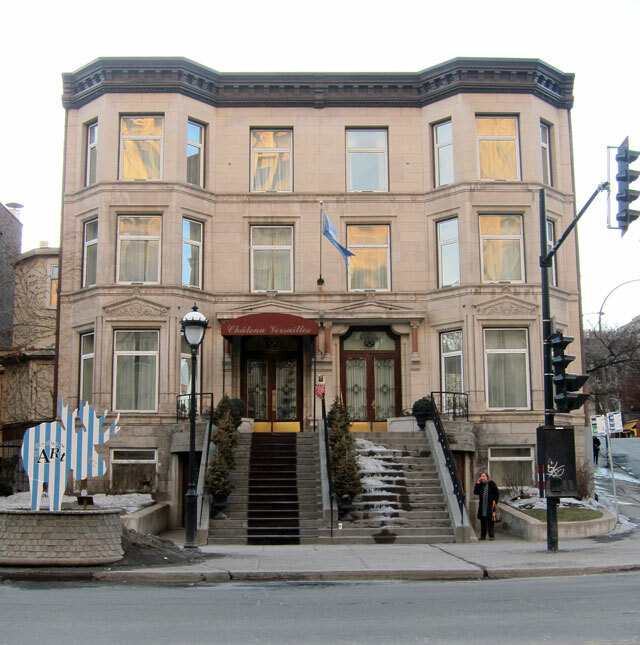 Five months ago I bought a TravelZoo deal for a boutique hotel in downtown Montreal – a deal at $209 for two nights with parking and breakfast. But I never had time to book, or time to plan. 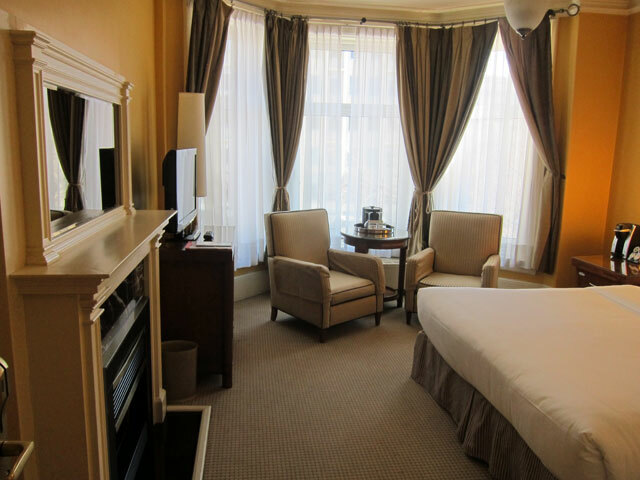 A couple weeks ago with the voucher expiring 31 March I called to book 26 and 27 March. “Sorry we are full,” I was told. But then given the option for these two nights, one past the expiration date – now that was nice. Other than digging out my Montreal travel collection, I still did not get to planning (do shunpikers really plan? – sounds like an oxymoron). On Monday night the 30th I did start screen saving maps to my Ipad, and realized that I could pickup backroads before Burlington to the border. 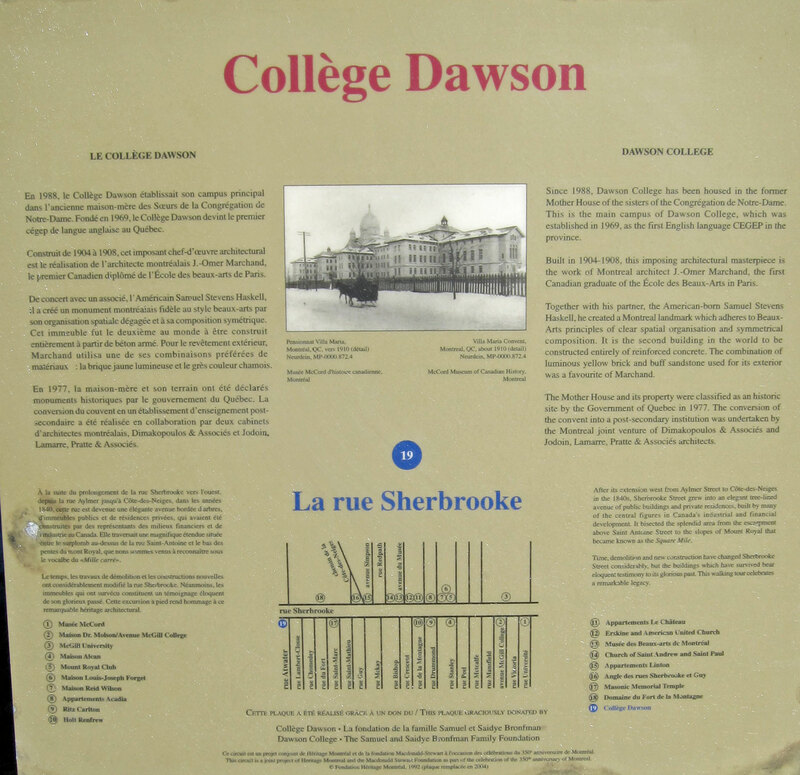 I have been to Montreal maybe 10 times, but I had to “fill in the map” in one area of town. 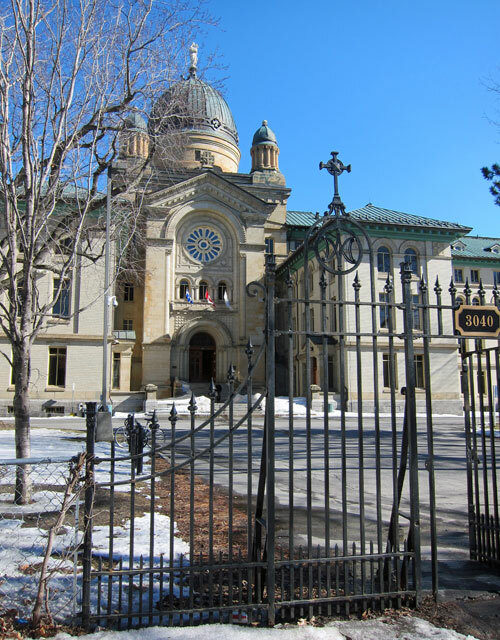 Montreal you may not know is a large island, and its preeminent feature is Mont Royal. 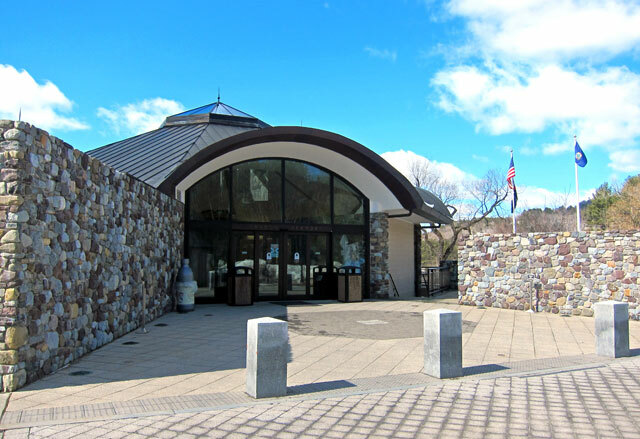 I departed a tad after 9:30 AM, and whenever heading north on I-91 I always stop at the Vermont Welcome Center and Veterans Memorial which is about an hour from home. Always need to check the brochures to see what I may not have for planning purposes. There had been some fresh snow coating high elevation trees and making some wonderful mountain vistas once in the hills. This image does not even come close to the beauty today. Taking exit 11 I picked up Route 117 for Essex Junction in 8 miles. Appropriately named for all the converging and crossing train tracks, sadly there was no old train station, just a small modern Amtrak whistle stop. I followed 2A out of town north to Colchester (nothing there), and soon turned onto US 2 and US7 north (you know my favorite road, at least along the Housatonic River). 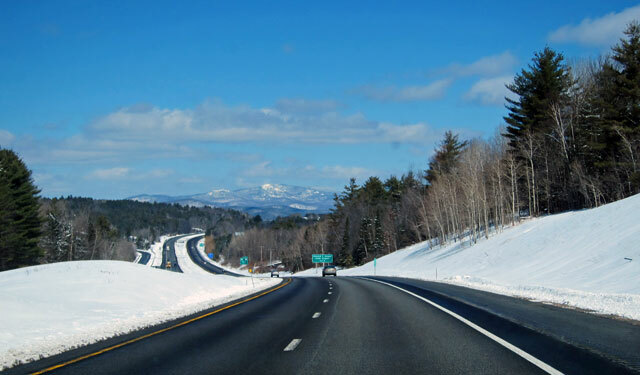 I continued through Milton (still nothing) and got back onto I-89 for Canada. Once you cross the Green Mountains and head north, it is amazing how flat the land is, simply farming land well into Canada and continuing until almost in downtown Montreal. I have driven a number of times to Montreal, and it is easy. And there is no traffic in downtown Montreal to speak of. I arrived at my destination – Chateau Versailles Montreal on rue Sherbrooke within the Golden Square Mile just before my 3PM check in time. Château Versailles Montreal. One of the former residences in the area. My room is second floor bay window on left. 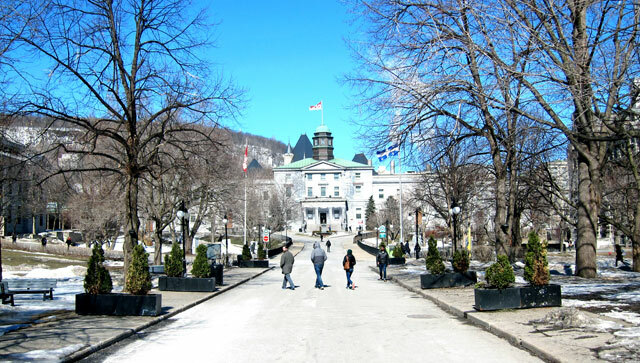 Originally the richest district in Canada (in 1900, 25,000 residents here controlled 70 percent of Canada’s wealth), this square mile is just below Mont Royal and includes McGill University. Sadly most of the early homes have been demolished. I got settled, and in moments “hit the streets” for almost four hours. In one of my guide books there are four suggested walks, so I headed off west on the longest walk touring this residential area reaching Greene Street before heading back towards the more built up downtown. Built originally as a Nunnery in 1904-8. Back in central downtown I dropped into the renowned underground which consists of maybe 40 kilometers of subterranean walkways to protect folks from the weather changes. 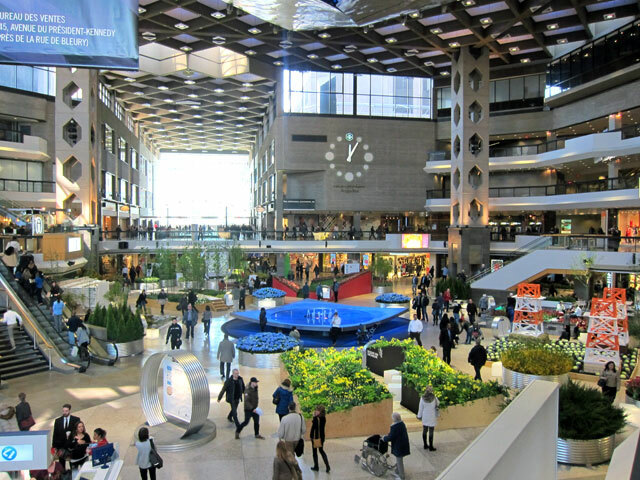 COMPLEXE DESJARINS – just one “mall” sandwiched between buildings unobtrusively and connected underground to everywhere else. With the walkways connecting metro stations and major buildings, I wanted to get to my favorite train station via underground. I just wanted to wait in the special waiting area for my next sleeper train to depart — well again someday. 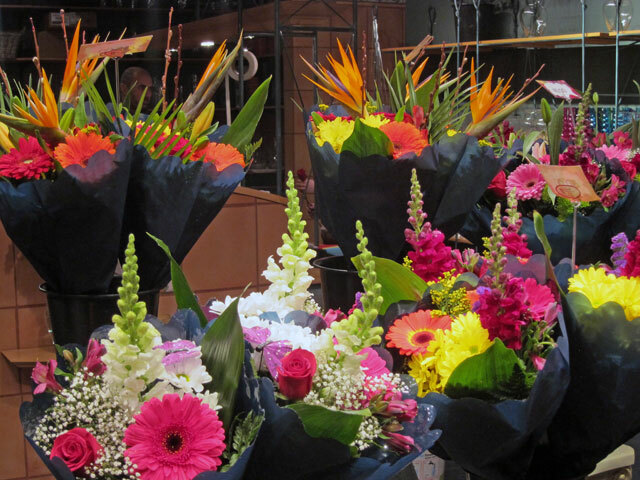 I then discovered an adjoining area I had missed before, Les Halles de la Gare with exquisite food booths, restaurants, bakeries, liquor store, and flowers. Anything you would want to pick up for your train ride home. And when I came back out I found some great reflections. 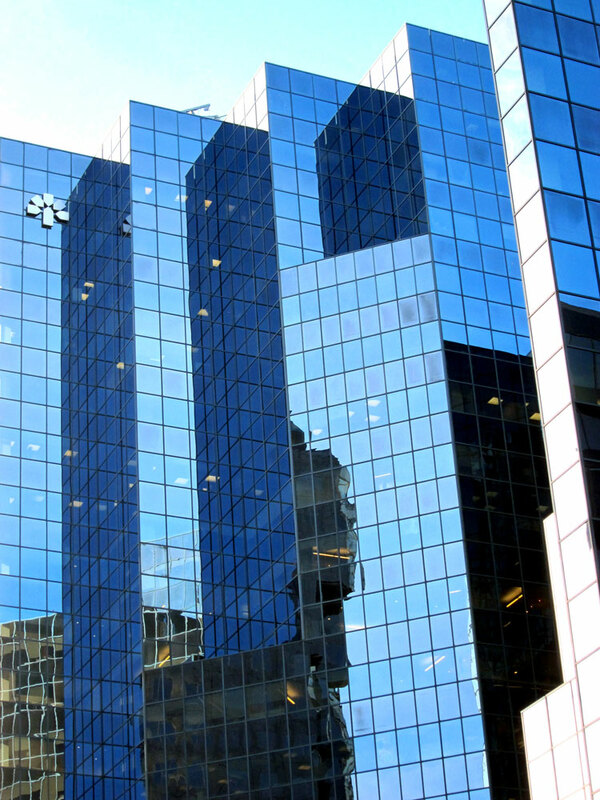 Remember when I first became enamored with reflective windows in Vancouver in 2011? And, I could not resist, here is a slide show of more – if you wish to open. This group of folks was as awestruck as I was with the reflections. On the streets there were many fun things to see. Some great architecture: (remember you can “click” my images to enlarge. 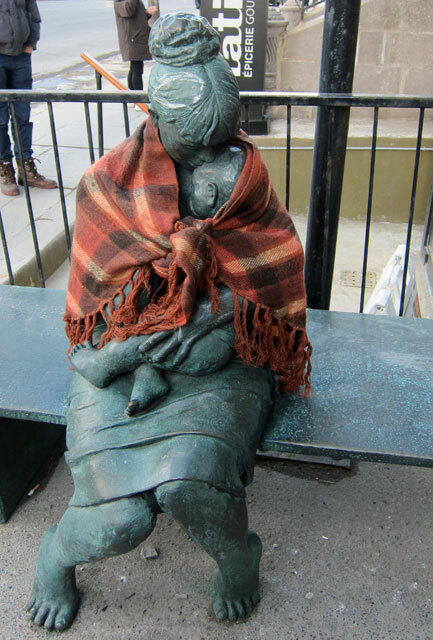 Even a statue can get cold, and a kind soul add a shawl to warm it. 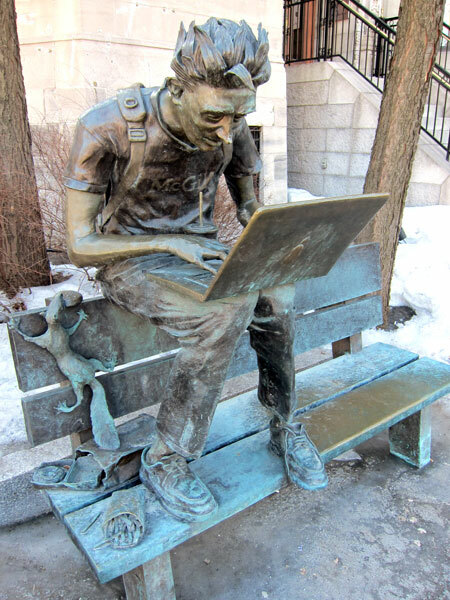 A McGill student hard at work. 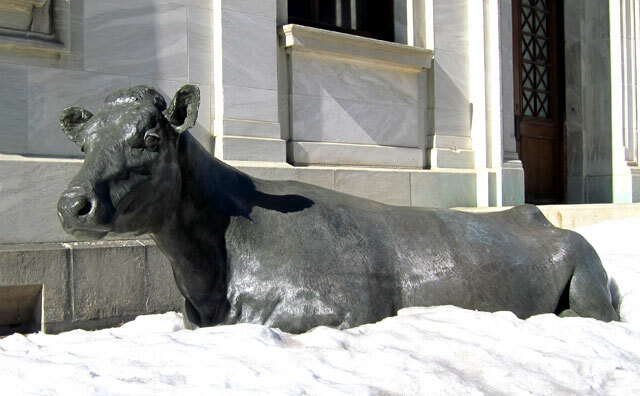 And, this poor cow is just waiting to be allowed into The Museum of Fine Arts on rue Sherbrooke. Wednesday’s route as I planned out took me west from my hotel to McGill University (founded in 1821 as an English speaking college), around the more central part of downtown, south back through Gare Centrale, and I had to see the older Gare Windsor. 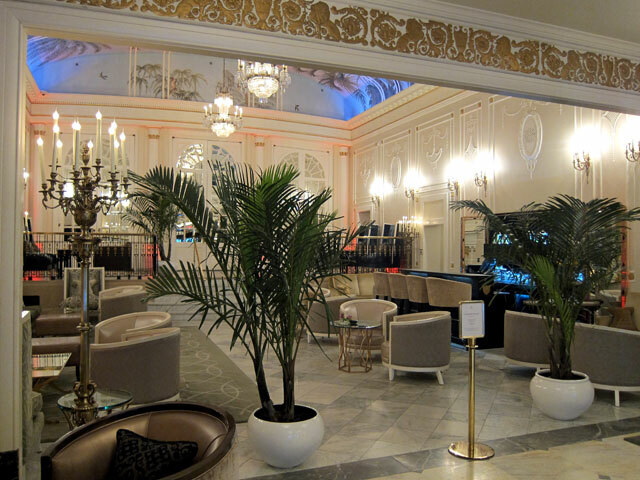 On the way to McGill I popped into the Ritz Carlton which opened to a New Year’s Eve party on December 31, 1912, and essentially is unchanged in all its elegance. I had to sneak at least one image. As you enter the Ritz Carlton, Montreal. A great lounge area. 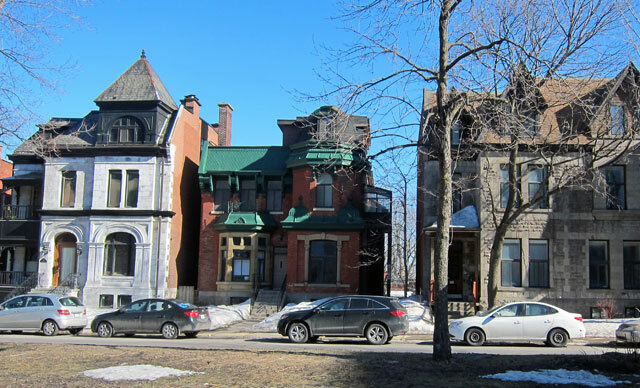 Next came McGill University taking up most of the area from rue Sherbrooke to Mont Royal and environs. I read about the Redpath Museum and wanted to see it (admission free). 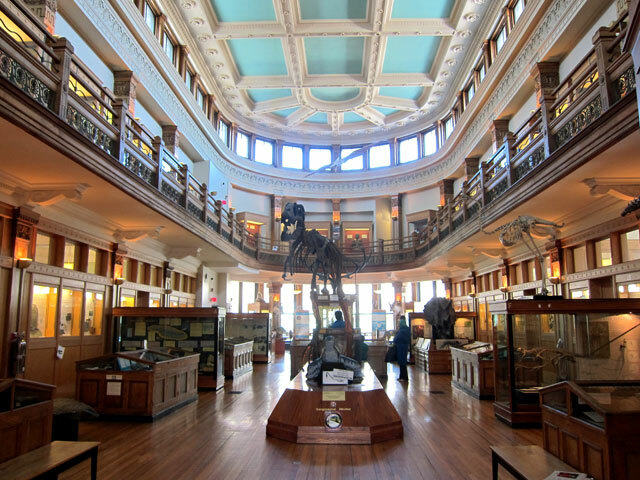 A museum of natural history, it was built in 1882 as a gift from the sugar baron Peter Redpath. The museum itself is a museum, however the exhibits (which are excellent – that coming from a museum aficionado) are not as large as they originally were because the side spaces have been changed into office space. Old images show case after case of mounted specimens – the old way done in natural history museums. The main floor of the Redpath Museum and upper floor balcony. On a couple of these panels (if you open them up) you can read about Sir William Dawson and Peter Redpath. London has Harrods and Canada has The Bay – The Hudson Bay Company’s store, an outgrowth from its history. So, I had to see it. 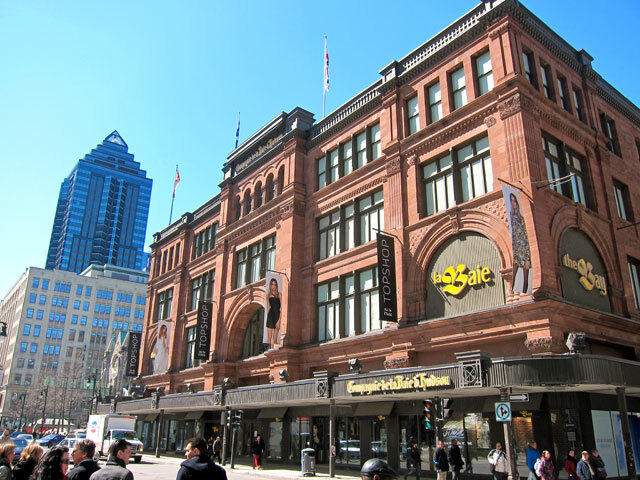 THE BAY – Hudson’s Bay Company store in Montreal. I was disappointed. Nowhere near the excitement of Harrod’s – just soft goods on the upper floors with some housewares. The first floor (as is Department store custom) was all cosmetics and women hawking fragrances. RAY RECOMMENDS – hop British Air for a day or two holiday at Harrods’ main store in London. 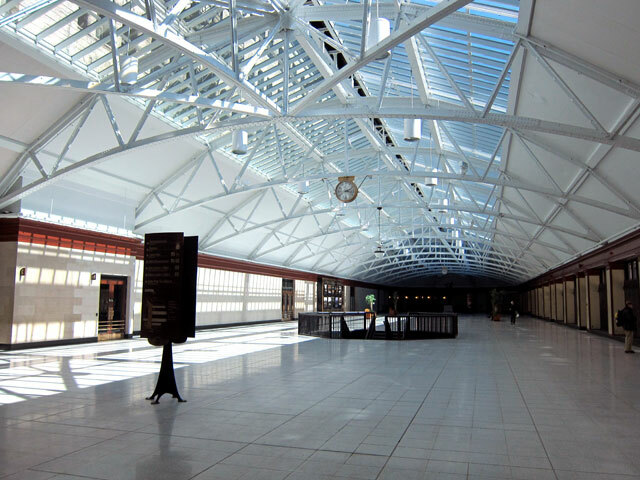 Next I had to see Gare Windsor – the commuter rail station. You know I like trains. 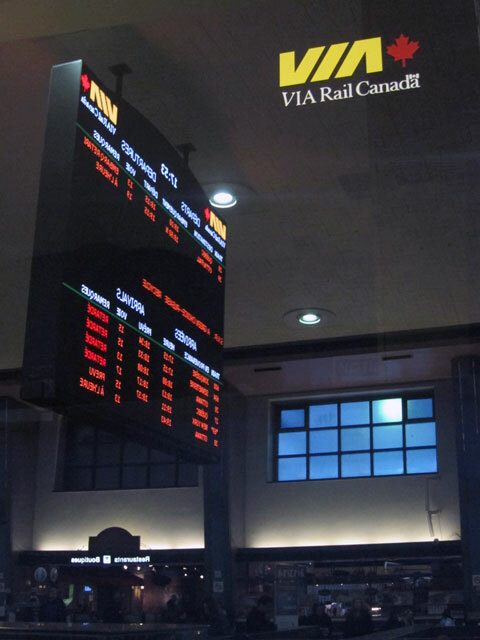 The main waiting room – Montreal’s Gare Windsor. and what it was during World War II. So sad, but fortunately saved from the wrecking ball. The station was relocated to the west (and is small) to make room for construction of Centre Bell – a sports and entertainment center and home of the Montreal Canadiens. Centre Bell takes up the space where the tracks came into the old station. The old station is in nice repair and used for office space. Statue in memory of the Canadian Pacific employees who served in WWII, and lost their lives. Looking north through the original waiting room. Entrance to train sheds would be to the left. End of the tracks stopping for the minute new station area. Part of the facade of the original station. Original Gare Windsor to the left, and new Centre Bell on the right. Original tracks would have run through new center and to the left. 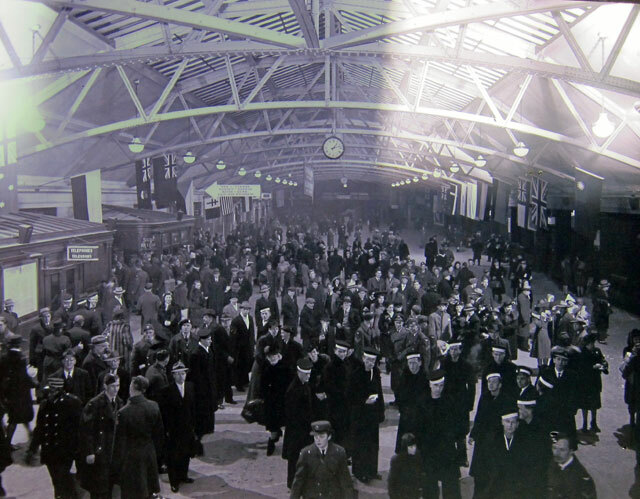 Train sheds – as they were. 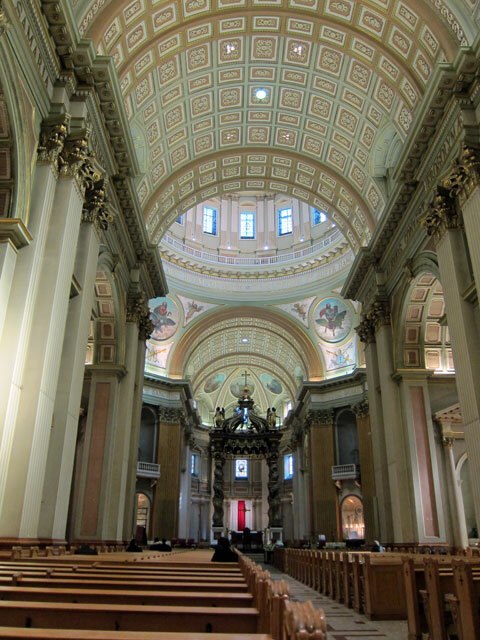 I next visited The Cathedral St. James the Greater, begun in 1894 and completed in 1904. 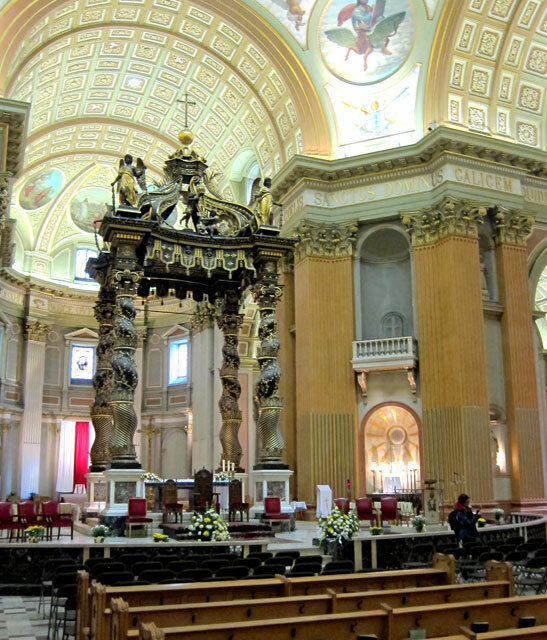 The cathedral was designed to replicate St. Peter’s in the Vatican. The Baldacchino is even a reproduction of that in the Vatican, and was created in Rome in 1900. Close up of The Baldacchino – just as you would see in Rome. Wednesday evening I had dinner at a Moroccan restaurant. Doing research for an upcoming adventure – wow, just wait! 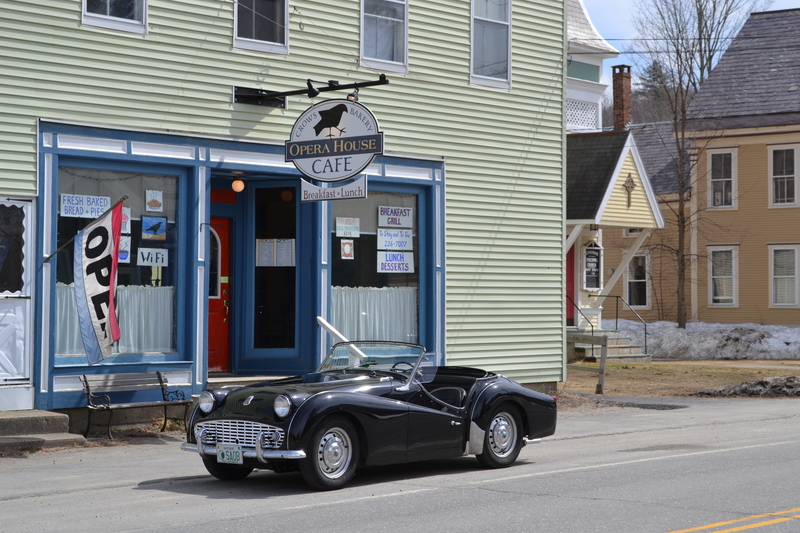 But Thursday, April 2nd, came, and time to head south – not that far south! But you know I never go directly. There was a route back to the border I had not been on, so get out your maps. I left Montreal on the expressway number 15, a tad to the west. I knew what route number I wanted to exit at, but guess what – the expressway signs only had town names (in French of course) and not route numbers. Well, I exited where I thought I should be, and picked a route – no route number signs there either. Soon came to a town with a Route sign that I wanted – Route 221 which I followed south until I found what I wanted – Route 219 to the border. No need for you to explore here -I did it for you. Nothing but flat rural farmland with nothing of interest. At the border I provided the US Customs agent with some entertainment. He could not understand why I was on the little back road instead of Expressway 15 to I-87. He now knows all about shunpiking and filling in the map. Plus I wanted to say I was at the beginning of NY Route 22. 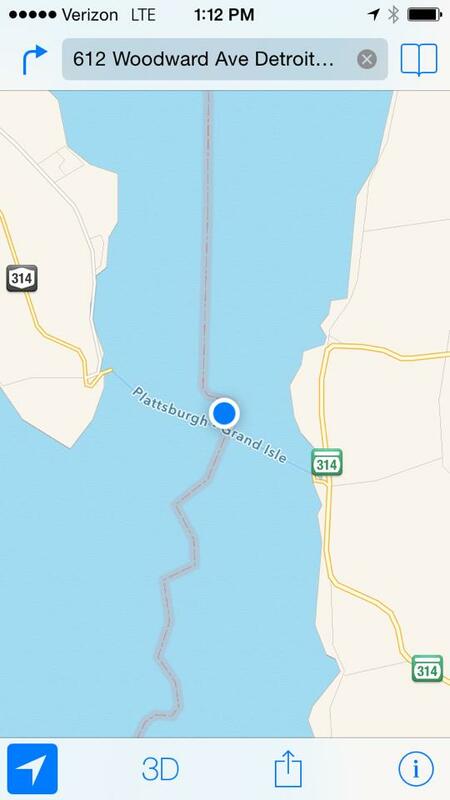 Which I then followed to Plattsburgh where I had lunch. Then it was time to cross Lake Champlain into Vermont. I posted this “maps” image on Facebook asking, “Where am I?” That was either a quiz question, or a request for help to sort out my confusion, depending upon your perspective.. I picked up US Route 7 (you know my favorite) and headed south to pick up Route 103 to Chester thence home. I stopped at some favorite antique shops – sadly no expenditures. It was fun to explore with leaves off, the views across the lake to the Adirondacks amazing, and the Green Mountains to the east. But the cities of Burlington and Rutland are wearing thin on me. 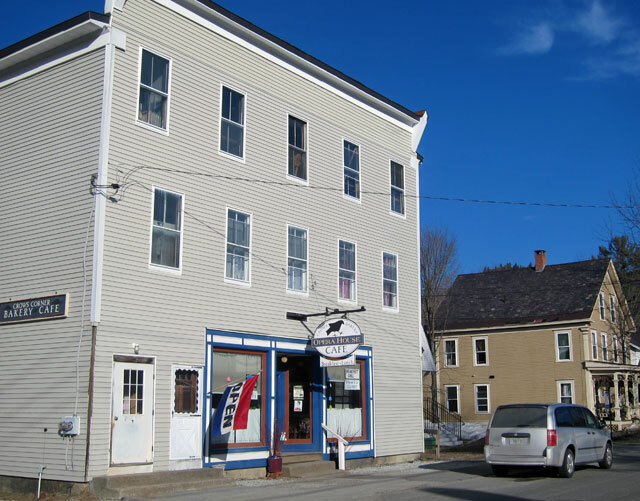 I stopped at Crows Bakery in Proctorsville, VT. On Tuesday night I got an email from a web designer working on a website for the bakery, and she wanted to use an image from my very first post “from away.” I love to share, and of course said yes. Little did she know that Proctorsville is on the way home from Montreal. This entry was posted in Day (or maybe two) Trips and tagged Canada, Crows Bakery, GARE CENTRALE, GARE WINDSOR, Golden Square Mile, McGill University, Montreal, Proctorsville, Redpath Museum, Via Rail, VT. Bookmark the permalink. Loved your pictures of my birthplace! Also, I have eaten at the Crow’s Cafe. Did you go into the nearby shop ” Six Loose Ladies”? Thanks Chris, glad you enjoyed the pictures. When my stepmother visited in 2009 I took her to Six Loose Ladies. For those of you who are wondering, this is a shop with yarn and textile products for knitters and crafters. I am always amazed on what you pack in with so little time. Good shunpiking.